Product prices and availability are accurate as of 2019-04-14 19:57:17 EDT and are subject to change. Any price and availability information displayed on http://www.amazon.com/ at the time of purchase will apply to the purchase of this product. A set of 2 inch versions of Riddell's Speed helmet with official shell colors and logos. A cutting edge collectible. 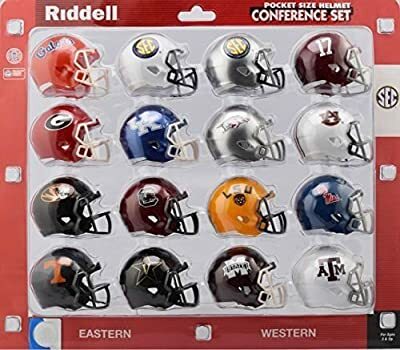 The SEC set includes: Florida, Alabama, Georgia, Kentucky, Arkansas, Auburn, Missouri, South Carolina, LSU, Mississippi, Tennesee, Vanderbilt, Mississippi State, Texas A&M, 2 SEC logo helmets.